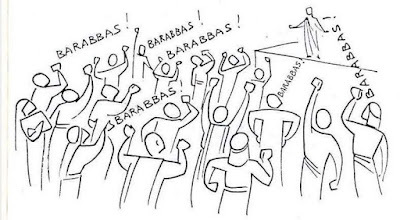 The Barabbas segment is wholly fictional, in spite of the fact that the name Barabbas is actually attested on ossuaries (small stone coffins) from the period. 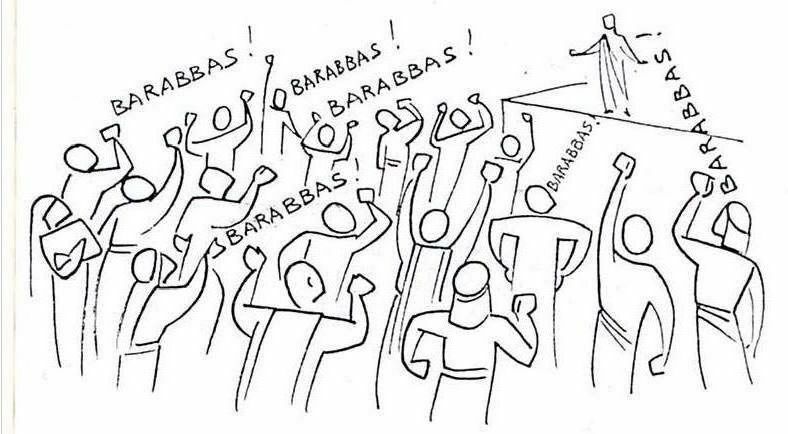 Barabbas means “son of the father,” the son (bar in Aramaic) of Abba, the Aramaic address Jesus uses for God in the Lord’s Prayer. That “son” is substituted for Jesus, who in Christian minds is the “son of the Father.” When Pilate asks the crowd what he is to do with “the king of the Judeans,” they call out to have him crucified (vv. 12-14). There is considerable irony in that scene: the Judeans are now to assume responsibility for the death of someone called their king (v. 12). Pilate gives way to the will of the crowd, has Jesus flogged in accordance with Roman practice, and turns Jesus over to his enemies to be crucified. 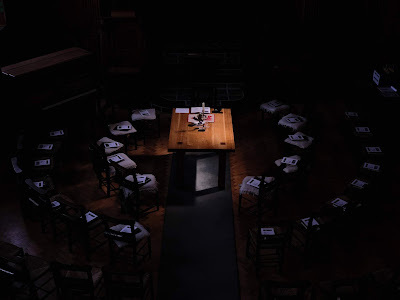 That scene, although the product of Mark's vivid imagination, has wrought untold and untellable tragedy in the history of the relation of Christians to Jews. There is no black deep enough to symbolize adequately the black mark this fiction has etched in Christian history. As a child, my world was powerfully shaped — as are those of still too many children today — with the dangerous and simplistic, binary idea that the world can be divided into “goodies” and “baddies”: Indians in the westerns and Germans, Italians or Japanese in the war films I watched on Saturday morning TV who were the baddies whilst cowboys, the British, Americans and the French were the goodies. Simple. Looking back forty years I can see how easy it might have been for me to have accepted Matthew’s evil verse as a true representation of Christians as the “goodies” and Jews as the “baddies” but I was graced beyond measure by the fact that my paternal grandparents had a long and close friendship with the Jewish family who lived next door in north London. When my dad and their son were both courting, they sometimes went out together to the pictures and, following their respective marriages and we children came along, that is to say, me and my sister and their two children, they kept up their friendship and, once a year around Christmas/Hanukkah time, we’d all meet up either at our house in Ware and then Kirby-le-Soken or at their house in north London and a great time was had by all. It was always good fun but I particularly remember the visit to their house on December 11, 1972. 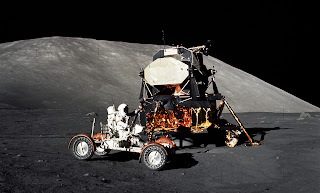 I remember the exact date because we children were allowed to stay up late to watch the landing of Apollo 17. Thrilling, world and culture uniting stuff. I can see that this friendship with a Jewish family was, in retrospect, one of the most influential experiences of my early life because it taught me to be acutely suspicious of all stories that attempted to split — or at least had the effect of causing a split between — people into binary us/them categories where ne’er the twain shall meet. The fact was that our friends were clearly not the culpable villains of the gospels, committers of deicide — of killing God — but were, instead, ordinary, good, kind people. And so I found myself choosing the truth of that real friendship over the lie of the gospel stories just as in later years, after careful reading about the subject, I chose a proper, rounded understanding about Native American Indian, German, Japanese and Italian cultures over the racist and xenophobic pictures often presented to me in too many films, newspapers and conversations down the pub or at certain family gatherings containing a racist relative. Anyway, the massive disjunction between my poor religious education and the reality of a family friendship with a Jewish family set-up in me a strong desire better to understand how this anti-semitic state of affairs could have come to be. This eventually blossomed into my later post-graduate study in the field of Jewish-Christian relations and the discovery that the story which so disturbed me was, in truth, an utterly fictional one. Here I don’t have time to lay out before you the historical and textual evidence for this but later on, if you want to know what that evidence is, please talk to me. However, despite the story’s utter fiction, I want to conclude with a few words about another serious lesson that the false binary question of “Christ or Barabbas?” might teach us today. The essence of liberalism is negotiation, a cautious half measure, in the hope that the definitive dispute, the decisive bloody battle, can be transformed into a parliamentary debate and permit the decision to be suspended forever in an everlasting discussion. As you can see Schmitt did not like liberalism's commitment to the value of ongoing dialogue at all and he sought to counter it by promoting what we might call a philosophy of “decisionism” which had some very nasty authoritarian overtones. not as metaphors or symbols, not mixed and watered down by economic, moral, and other ideas; nor are they to be taken psychologically as the expression of private feelings and tendencies. . . . Here we are not concerned with fictions and normatives, but with reality as it is and the actual possibility of this distinction. is not just any competitor or adversary in general. “Enemy is ... in the last analysis a fighting, human totality; but it is at least this. Whether it is fighting or not depends upon the actual circumstances.” And then he indicated the source of his choice of these particular terms as the specifically political concepts: “The concepts friend, enemy, and battle have a real meaning; they obtain and retain this meaning especially through their reference to the real possibility of physical killing.” Schmitt’s concept of the political ultimately derived from the specific and actual possibility of death in battle, from the most limiting of all human situations — death. Now, here’s my chief point today. In our own age in which our, what was once called British culture, has clearly lost it’s orientation (although some may say, with some justification, that it is in fact English culture which has lost its orientation), what deeply worries me is that a similar philosophy of decisionism is threatening to become popular once again in certain people’s and groups’ religious and political attempts to solve the problem. It’s a philosophy which deliberately seeks to present people with a series of ongoing, false binary questions the answers to which divide the world up into friend/enemy, indigenous/alien, Christian/Jew, Christian/Muslim, left/right, black/white, in/out, leave/remain, and many more besides, all in the hope that this method will revive in “the people” (whatever that slippery phrase means) a powerful sense that by answering these kinds of binary questions they are, in some meaningful and exciting way, going to be heading purposefully towards a restored national political, religious and personal sense of identity and confidence. But this is a dangerous fantasy. To see this we need only recall that ancient, fateful question “Christ or Barabbas?” and note well that it was utterly unable to deliver the Last Word on anything we might then, or now, have considered to be good and decent and of lasting worth and that, in fact, it was ultimately only able to deliver up to us all kinds of unfulfilled (and unfulfillable) expectations that led inexorably to mistrust, hatred and, at its worst, to an almost unimaginable level of cruelty, repression, violence and, ultimately, genocide. Given this, it seems to me that today, perhaps the chief lesson we might learn from the “Christ or Barabbas?” story is not simply that it is a dangerous and pernicious fiction but also that it contains a false and extremely dangerous and deluded binary question that could only ever to serve to create a false and exceptionally dangerous us/them situation. With this in mind, I hope the story might stand for us as a salutary, Holy Week warning not to make the same kind of fateful mistake in our own time and context. Let’s continue to think, instead, about how best we may heed Jesus’ proclamation to love our neighbour as ourselves — a proclamation which, remember, includes even those we perceive (or are being encouraged to perceive) as enemies. Nothing less than this will ever do and the cry from the crowd, from “we the people”, needs to change from Christ OR Barabbas to Christ AND Barabbas.